SSB is a commonly used abbreviation that stands for single side band radio. We are certainly not radio experts here at The Rigging Company. When it comes to specific radio product knowledge, we always recommended that our customers seek the advice of a certified marine electrician. However, just like with all other mast related electrical items, we as riggers/spar builders, are the experts on installing these items in a safe and functional manner. As we discuss some of the SSB insulator brands, some are better than others, not necessarily in terms of radio performance, but rather, structural integrity, ease of install, as well as repair/replacement. Hayn Marine makes some of the finest standing rigging fittings in the industry. The Hi-mod SSB Insulator is no exception, and is our premier choice when it comes to insulating backstays for single side band radio use. This product offers ease of installation, safety, and functionality, all in one attractive, well built insulator. Although these insulators are likely one of the most expensive of the lot, what sets the Hi-mod apart from the competition is that they are insulating using a stemball type fitting which is suspended in epoxy (as pictured here). This is unique compared to other manufacturers who use a threaded plastic (likely Delrin) buffer to insulate the wire section that is being used as the antenna. The issue with this is, simply put, your backstay is relying on plastic threads holding it together. In Hayn’s design the epoxy socket has a structural benefit and if anything fails, it will be the epoxy; this will allow the stemball head to fetch up against the stainless steel cup (or the body of the insulator) that it rests in. The result, if failure should occur, is a slightly looser backstay (which can be re-tensioned using a turnbuckle or backstay adjuster), but one that is whole nonetheless. This is the big selling point for this product. To top it all off Hayn offers a multitude of end fitting options for versatility in installing their insulators properly. Alexander Roberts Co. (ARCO) is perhaps one of the oldest standing rigging fitting manufacturers still in operation on the market today. Their insulators offer an aluminum body, similar Ronstan and the old style Navtec. This insulator, like the Ronstan model below only come with swage ends. Although it seems like ARCO products are getting harder and harder to find, we here at The Rigging Company still offer their products and they are still readily available. Sta-lok has built their reputation on mechanical fittings over the years. They also offer a full line of swage products, as well as SSB insulators. Sta-lok insulators have actually been around a very long time, perhaps since the beginnings of the SSB radio introduction on sailboats. Unlike Ronstan, Sta-lok offers many end fittings from mechanical fittings to swage, to eyes, to forks. Although they aren’t the most aesthetically pleasing, in terms of dependability, these insulators are rock solid and have withstood the test of time. For a price worthy option that offers various end fittings and has proven dependable…look no further. Ronstan, well known for some great products like calibrated turnbuckles as well as ball bearing blocks, make broad range of other high quality sailboat related hardware. Within their inventory of standing rigging fittings you’ll find their backstay insulators. 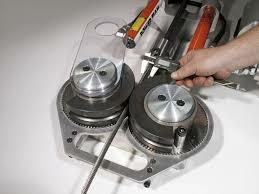 These are very cost effective, but only come with swage ends, as far as we know. The downside here is that this will require a special machine (which we have) to splice them into the backstay. Therefore, they cannot be re-used when it’s time to replace the boat’s standing rigging again. The Ronstan SSB insulator is a cost effective solution for someone looking for a quality product that is intended to stay in place for the life of the standing rigging. 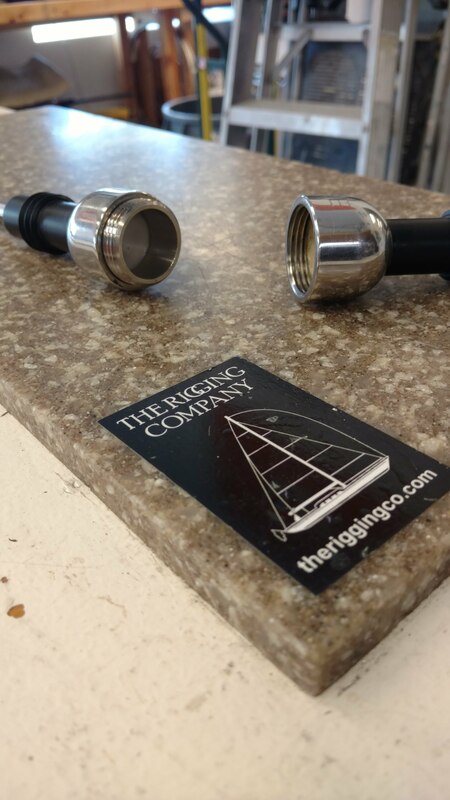 We here at The Rigging Company are authorized dealers for service and repair of any of the aforementioned products. Please contact us for further information regarding product details, pricing and availability; or simply leave us a comment below. We’d be glad to help. At The Rigging Company advice and tips are always free of charge. Thanks for the read and see you on the water. and there are riggers that steer clean of any type of insulator in the standing rigging — there was some interest in an antenna that was embedded in a rope that would be external to the standing rigging/mast – where has that technology going ?